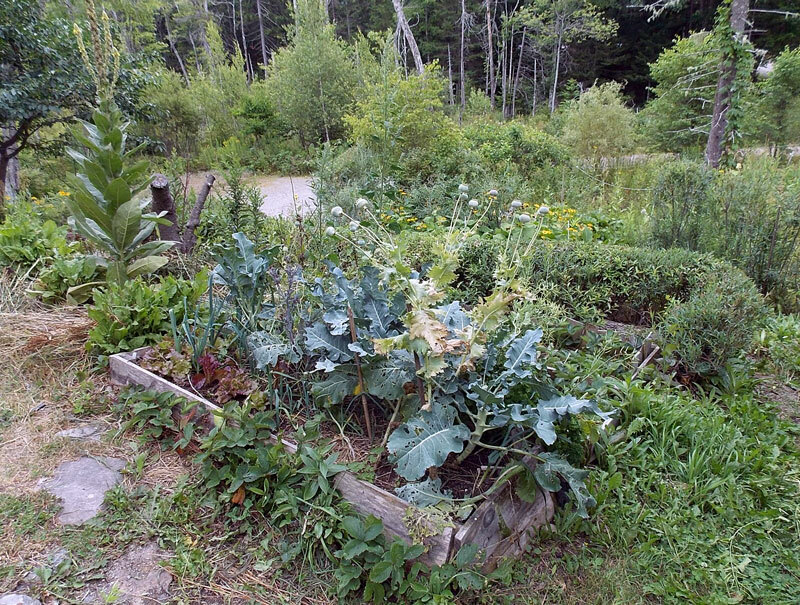 Just outside the dooryard, on the southfacing hillside: broccoli, breadseed poppies, sorrel, mullein, strawberries, parsley, and a Beta pie cherry tree all held in place by withy rows of Black and Scottish basket willow. Down on the lower level you can see the Washington Hawthorns providing a thorny barrier against deer (and almost enough haws for a batch of jelly in 2014) and the silver foliage of the snake willow. 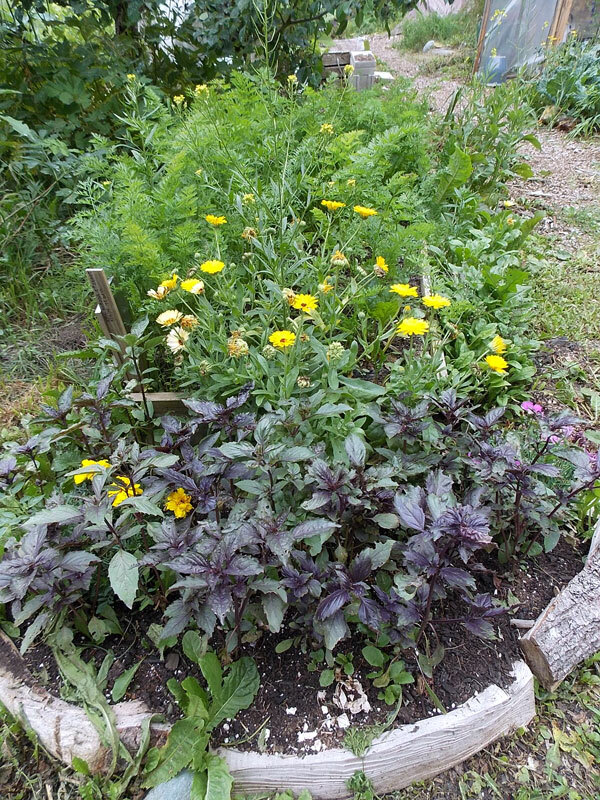 More from the dooryard: purple basil, pinks, calendula, and carrots grow under the Seckel pear tree. There’s an elderberry bush coming up on the left that will need to be transplanted (again!) into the swamp during Garden 2015. 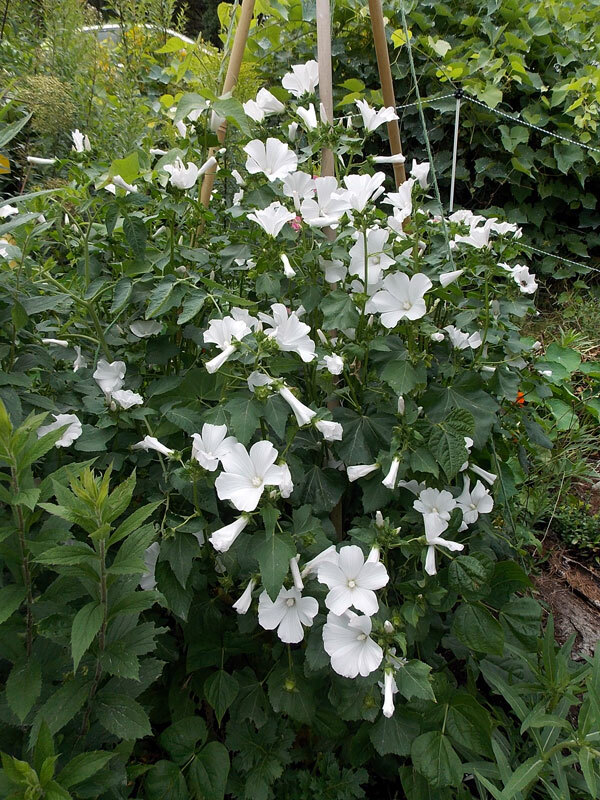 Pink and white rose-mallow, well, mostly white this year! It was nearly smothered by pole beans in August but managed well enough to be featured in several still life paintings. 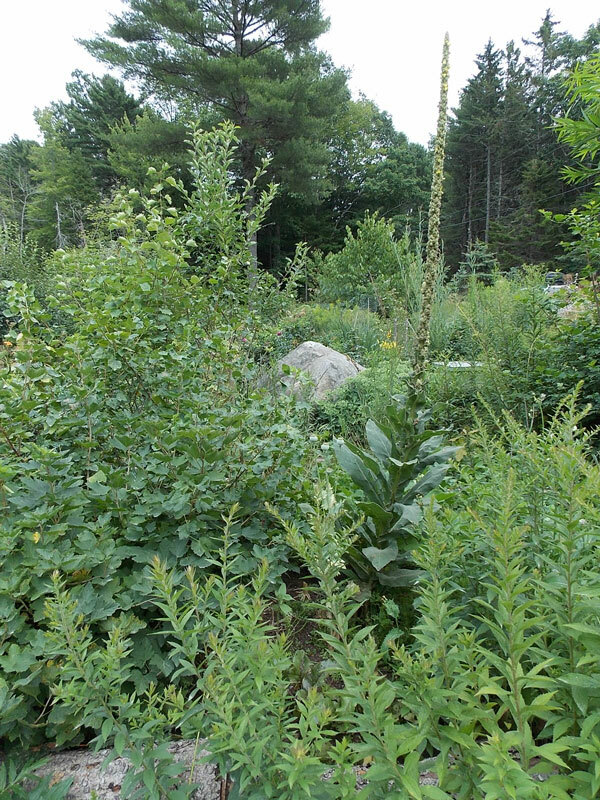 The chaos that is the lower garden center: mullein, Russian crabapple, marshmallow, goldenrod (for bee fodder), and one of the glacial erratics that characterize the Maine island garden. There’s a path in there too, somewhere. . . . 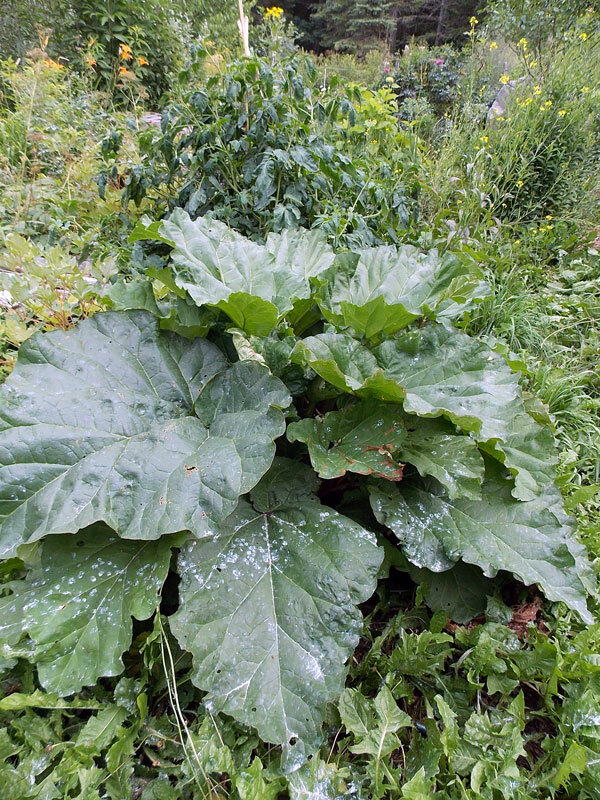 In every photo set from my garden there should be at least one very, very confused plant. 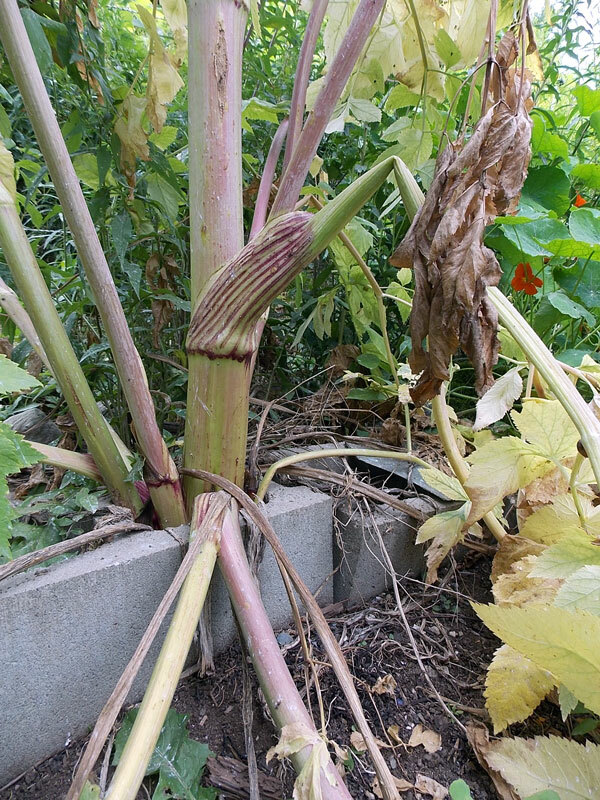 This Angelica decided to grow up through a cinderblock amidst the nasturtium and pole beans, and it did very well, considering. Can’t wait until July, 2015! This entry was posted in gardening, horticulture, Maine, the backyard, vegetable garden and tagged garden, summer, winter on January 20, 2015 by APo.